A Sweet Sound in My Ear. My mom took some new photos of me. She's a good photographer :) I enjoy pictures and they can capture my feelings and moments. I'm glad I have several pictures of myself on a balcony because I adore balconies from a great height. I feel like a bird way up there. God has blessed me greatly with such amazing women that I can fellowship with at my church. Ever since I joined my church, I have gotten to know these women and they have been my sisters in Christ. 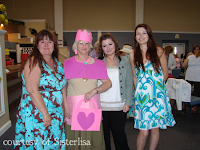 One of them is SisterLisa, who has become my mentor and my awesome friend! I am blessed to know her and her family! We have grown close since she taught my discipleship class and she also interprets for me at church. She has taught me SO much about how to be a Godly woman! I am so thankful that I have gotten to know her! And there is a small deaf ministry at my church that is currently growing! 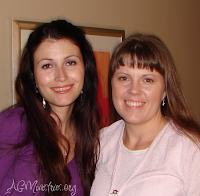 It is one of my desires to work with SisterLisa and reach the deaf community. God commanded us to reach out to others and share the Gospel to everyone. "And he said unto them, Go ye into all the world, and preach the gospel to every creature. "Mark 16:15. The deaf world is where I want to enter and preach the Gospel. Pray for us as we go! Happy Birthday to me. I am twenty-four years old today. I never thought there was life after nineteen but there sure is! God has blessed me with a beautiful day today. He gave me my favorite kind of weather too! The air is crisp and cool, the sky is vividly blue and the leaves are falling down to the ground. I'm watching the birth of Autumn. I am sitting here, sipping my cinnamon roll flavored coffee and I just feel funny today. There's hope and joy in my heart right now. It's like I have no idea what my life is going to be like because God is planning it for me! I can't wait to see what he has in store for me!! This morning I thought, "I am so glad I was born so that I'd know the great wonders and beauty of God's love." Thank you God for choosing me to be alive and not only to live, but to be yours forever. The two beautiful reasons why I smile everyday. I was sitting in the bathroom and I am not going to tell you what I was doing. Anyways, I suddenly realized that I forgot to thank God for something incredible that he did for me and my family. Let me tell you what happened first. We moved into a cheap apartment that approved us quickly since we didn't have much time to move out of my previous house. I had no idea that we had moved into a dangerous neighborhood. This area is covered with drug dealers and gangsters. What really shook me was that a gang wearing white masks banged on our door and tried to trick us into opening it. They were going to invade our home and do who knows what! The gang has been back at our home three times! My family and I are horrified and we are trying very hard to keep safe. I have been worried sick for my two boys. I praise God that we found a lovely apartment to move into in November but we have to hang tight until then. I realized that God has kept us safe all this time. They tried to break into our home three times and three times they failed. It was the Lord! The first time they banged on our door, we were on the way to open it. My mom and I suddenly had this urgency in our hearts NOT to open it. It was weird but we decided to listen to our feelings. Praise the Lord! And the other thing is that God must have made the landlord forget to make us sign a lease. We have been living here for over a month and have never signed any papers! Imagine that! God must have prevented that so we are able to move out! No harm, no evil and no danger can come upon me unless it has been through God himself. I am safe even in the most dangerous places in the world because God is with me! My soul rejoices!! A good friend of mine suggested this website called "No Greater Joy." I decided to visit this website and I am blown away. It has many articles on how to raise children the way God had planned. I have been taking notes and making lists so I won't forget. These are valuable advices and amazing articles by Christian parents. I recommend it! Visit www.NoGreaterJoy.org! 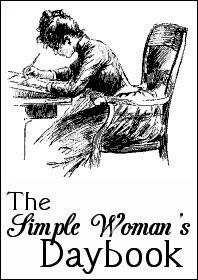 I have seen several of my girl friends participate in this fun thing to do online called "The Simple Woman's Daybook." If you would like to participate, then go and visit http://thesimplewoman.blogspot.com/. I recommend it :) Here is my first one! Outside my Window.. is a dark parking lot with a dim light on. I am thinking... about what I should write in my blog next. I have the issue in my heart and need some time to ponder on how to express it. From the learning rooms... are a couple of library books that need to be returned. Oops! 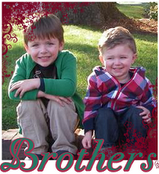 I am thankful for... my two darling boys and a wonderful mom who is also my best friend. I am thankful for an amazing church that is my second home and friends that are my spirtual family. I am wearing... a long skirt. I need to buy more skirts so I can throw out all my pants. I am reading.. "Heaven is Real" by Don Piper. It is the sequel to "90 Minutes in Heaven." I do recommend it! I am hoping... all my hopes rest in the hands of the Lord. I am creating... a life and a home. I am working very hard at this and need stability first before the rest comes. Around the house... the house is finally squeaky clean. I spent all day catching up on chores! One of my favorite things... is a quiet moment alone where I can relax and do whatever I am in the mood for. Most of the time it is reading or writing. A Few Plans For The Rest Of The Week... are some errands but tomorrow is our park and ice cream day! Thank you Lord for giving me Tuesdays back! This is my little Landon when he was just a wee baby. Now he is nearly four years old and in preschool. I am in such awe of how he has grown into a little gentleman and I can already see God's hand in his life. He has just started preschool so I am going through this emotion from grasping that my baby is growing up so fast! Something happend to me today that I wanted to share with you guys. I know there are a lot of people out there that have a hard time believing that spirtual things may happen. I have experienced many "unusual" things in my lifetime. I experienced one today that I will never forget. I was at the funeral home with my mother while she was taking care of my grandmother's funeral arrangements. I had Brady with me and I was entertaining him in the waiting room while my mom was in the office with the funeral director. We were there for an hour. During this time, Brady ran through the back hallway towards the back of the building. I had to run and catch him. As I was carrying him back to the waiting room, I suddenly heard a woman's voice clear as day. She said, "Charlene." It was very loud against my ear (with no hearing aid on that side) and I could hear it as if I were a hearing person. It even echoed a little at the end. I turned around and no one was there. I walked all around and there was definitely no one there. My mom was in the office with the funeral director on the other side of the building with the door closed. The entire place was quiet. I believe my Nana called my name. There is no other explanation. It was an amazing experience and I just got a huge sense of peace like everything was alright. It wasn't scary at all. I am blessed to hear her voice one last time before I see her in Heaven. 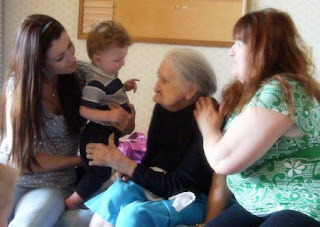 My grandmother, Lucille, that we lovingly called "Nana" passed away on Thursday evening. She was eighty-eight years old and lived a long, full life. I have many memories of her while I was growing up. She was a vibrant and sassy woman who always wore sparkling sweaters and had her hair in curls. I used to watch her put on her makeup. She was the one who taught me how to walk straight because back then, I used to walk like a duck! I remember that she was always there for me while I was growing up. She fell into alzhimer's during the last few years of her life, but I will always remember her as the way she was. Rest in peace and I'll see you soon. Hi everyone! Here is an UPDATE! I know I haven't been on since forever! Good news, it won't be forever anymore ;) I moved in with my mom (moved AGAIN for the second time this month and I am plain exhausted!) to save money for Landon's school. We are doing great! My mom opened an internet account today and has a computer in her room so I will be checking it more now. I miss the blogs and the devotions terribly!! I am thrilled to start writing again! Everything is good! Landon started preschool this Wednesday and he is SO PROUD of himself! He is doing wonderful! I will post pictures soon!! Love you all, from ME!